Dental - Earl Grey Veterinary Services P.C.Ltd. Dental disease is very common in cats and dogs. We now know that dental disease such as tartar build up and gingivitis causes extreme pain and discomfort along with internal organ problems. Extractions of diseased, broken, loose, or infected teeth are often necessary and cannot be adequately determined before anesthesia and initial cleaning. These extractions are critical for maintaining kidney and heart health. 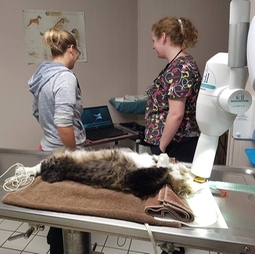 We use an ultrasonic dental machine to do a thorough dental for your pets and we are able to do digital xrays to determine the health of your pets teeth below the gumline.